Why does the BaBylissPRO Rotating Hot Air Brush Work So Well When Drying and Styling Hair? Sometimes you just don’t feel like putting much effort into styling and drying your hair. After all, it’s a task that you do almost every single day of your adult life. What if we told you that now you can style and dry your hair at the same time effortlessly? Don’t think it’s possible? Well, the reputable folks at BaBylissPRO say it’s entirely possible with their new 2-inch, Nano Titanium Rotating Hot Air Brush. That certainly caught our attention so we thought we would take a closer look at this rotating hot air brush’s review. 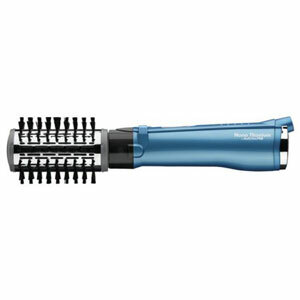 It’s so convenient to have just one hair styling tool both dry and style your hair. This hot hair tool’s rotating 2-inch brush takes that ease of use even one step further. The BaBylissPRO Rotating Hot Air Brush will even help you add curl, waves, and body to your hair as you style. This hot air brush also has three different air temperature settings to choose from. With its 2-inch anti-static bristle brush you can give your hair some more shine and volume while preventing frizz at the same time. The BaBylissPRO Rotating Hot Air Brush has a very ergonomic design. Either a thumb or finger is always within reach of one of its control buttons or switches. It also comes with a very generous salon length power cord with an attached swivel end. This allows you the maximum freedom of movement as you move about using it. At 1 ½ pounds of weight, it’s slightly heavier than most hot air brush models. It can feel bulky after using it for a while. By far the most impressive characteristic of this hot air brush is its advanced Nano Titanium™ technology. It helps this hot air brush get warm fast, stay hot as its working and it protects your hair from damage by helping it retain its critical moisture. Of course, its auto-rotating brush is a unique too. It will grab your hair and help curl it in both the forward and reverse directions. You can also lock the barrel in place if you prefer not to have it spin on its own. This hot air brush from BaBylissPRO has a slightly better than average warranty. It’s warrantied for a period of 2-years from the date of purchase. This is not bad for a rotating hot air brush full of mechanical parts. Of course, as with all hot air brush products, we did have some questions and concerns about it. If you have very short hair this is probably not the hot air brush model you want to buy. Its 2-inch styling brush sometimes does not do a good job of latching on to very short hair. In addition to that, we also think the brush end is a little short as far as length goes. This means it may take a little while longer style and dry thicker and longer hair. 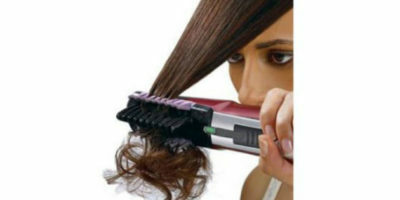 What’s not to like about a hair styling tool that dries, styles and even helps curl and give body to your hair? That’s why we all here give the BaBylissPRO Rotating Hot Air Brush a big thumb up for its design. It’s not perfect for very short hair types but for styling all other lengths of hair, it sure makes it simpler. 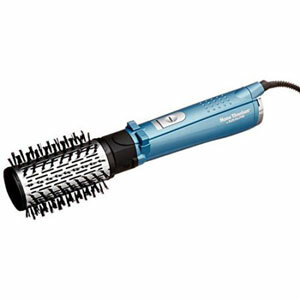 We like the fact it has such outstanding features as 3 different temperature settings, anti-static brush bristles, and its auto-rotating brush can spin both ways. What really put it over the top for us as a recommended hot air brush choice is its advanced Nano Titanium™ technology that helps dry hair quickly while protecting it from heat damage at the same time. 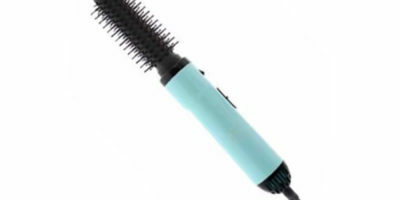 This hot hair tool definitely deserves strong consideration for purchase if you are searching for a new hot air brush.